Proofing the doughnuts on swing pans. 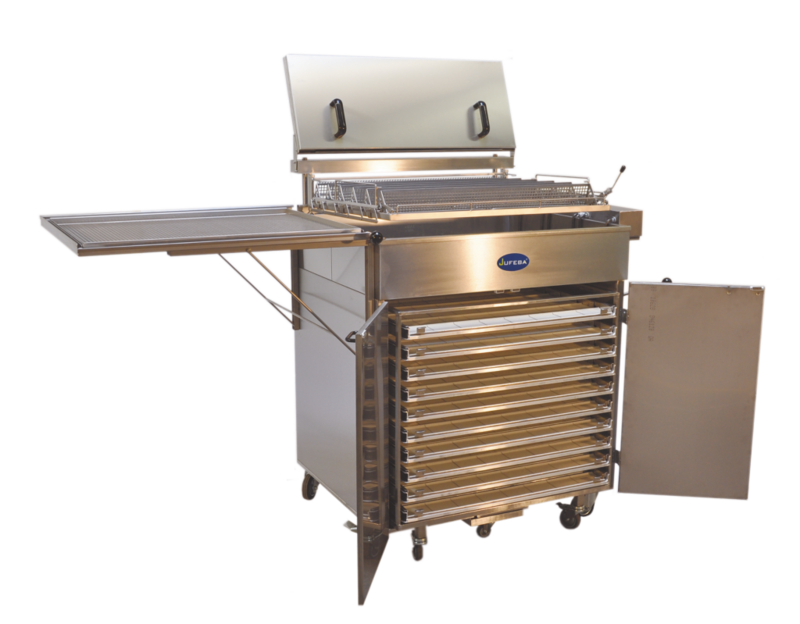 Proofer models with integrated proofer cabinet, optimal air circulation, separate thermostat – controlled heating and water tank. Proofer cabinet is complete double coated for heat insulation. For feeding the fryer with raised doughnuts just put the swing pans over the frying kettle and turn them easily with two fingers so that the doughnuts drop carefully into the fat. For feeding with other types of dough a cake doughnut depositor can be joined to the fryer. Baking the pastries in the frying kettle is possible with closed or opened cover flap. Removable electric heating unit with exact microprocessor temperature controller and safety theromstat controls the fat temperature during the hole baking process. All doughnuts are easily and softly turned to the other side by shortly lifting and moving the turning device into the opposite end position. You can turn as often as you want. After the last baking time lift up the turning device with the freshly-baked doughnuts to the highest position, move the unloading device between doughnuts and frying kettle, turn the turning device into the unload position and the doughnuts drop softly on the drain screen of the unloading device. Move back the unloading device to the drain board of the doughnut fryer. During the next baking process the pastries can be taken from the drain board for finishing. Optional a fat filter system is mountable directly onto all mobile doughnut fryers. Daily fat cleaning extends the life cycle of the fat. It is cost-saving and improves the quality of the pastries. Lifting and turning device as well as unloading device with drain screen.